In extreme sorrow, the staff of S. Jones Funerals and Cremations is embracing the tender hearts of the family of Lillian Whitaker, 87, of Enfield, NC. 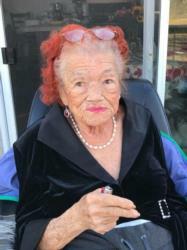 "Winkie", as she was affectiontely called by her loving family and friends, was called to her heavenly home on Saturday, October 06, 2018 in the comfort of her home surrounded by her loving family. The family will be present to receive family and friends during a visitation on Friday, October 12, 2018, 5 pm - 7 pm, in the chapel of S. Jones Funerals and Cremations. A Celebration of Life Service will be held 12 pm, Saturday, October 13, 2018, in the sanctuary of the First Baptist Church, 577 E. Franklin St., Enfield, NC 27823. She will lie in state one hour prior to the service. Sorry can't be with the family in person, but there I am in heart. So sorrow to hear of the passing of your loved one. May God Bless the family. To The Family of "Ms. Winkie" Please accept my sympathy in the passing of your loved one. My family and I will be praying that God strengthen you during this difficult time. God Bless You! To Lenne,Kenny and Winkie sister Jenny from my family (Lewis) to yours, condolences, and prayers, may God Rest her soul, she fought a good fight and is at peace, we love you guys! I am so thankful for the time I was able to spend with Aunt Winkie! She always kept you going with her many sayings and laughter. You will surely be missed. Rest in Paradise! Winnie will always be remembered. GOD be with you as you mourn but. remember the good times. God bless the family..
May Winkie rest in peace and prayers for the entire Ward Family as you go through this difficult time. She was loved much and was a "one of a kind" lady!!! May God strengthen and comfort you.